Recently, a jury in San Francisco, California recommended that Monsanto be forced to pay $289 million to a man who has been diagnosed with non-Hodgkin lymphoma. It was a pretty stunning result from a court case that has been watched very closely. I haven’t read the court transcripts, and I don’t know what the jury was told or what was withheld from them. And I have no desire to make accusations that either side was acting in bad faith. So I’m not going to comment about this specific case. But I would like to take this opportunity to review the evidence of the association between glyphosate & cancer from a pesticide applicator’s perspective. In the figure, each point represents the estimate from a study that evaluated the relative risk of developing cancer between people who had been exposed to glyphosate and those who hadn’t. 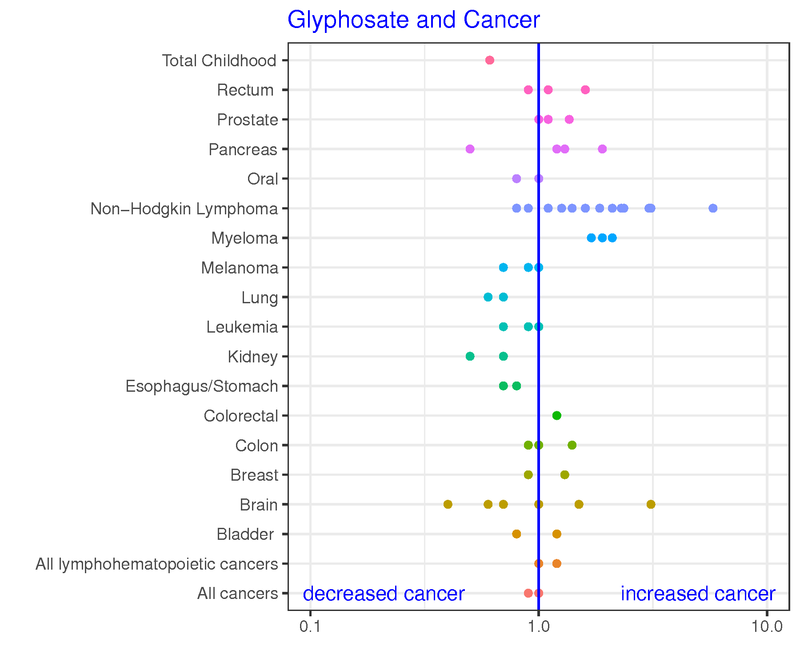 To interpret the figure, points on the left side of the blue line (less than 1) means that, on average, people who were exposed to glyphosate were less likely to get that type of cancer. Points to the right of the blue line mean that people exposed to glyphosate were more likely to get that type of cancer compared to people who were not exposed to glyphosate. Some important things to note about this figure: first, this is an obvious over-simplification of the data. Presenting the data this way excludes the uncertainty of the relative risk estimates. When a study presents these estimates of relative risk, they usually also present confidence intervals. Those intervals help describe the uncertainty associated with the risk estimate – if the interval is large, we generally have less confidence that the point is a reliable estimate of risk. Generally speaking, if the confidence interval spans across 1, then we would conclude that the evidence is too weak from a single study to suggest a link. If there is no real association between a particular type of cancer and glyphosate, then as more studies are done on this topic, we would expect to have similar numbers of points to the left as to the right of 1, or perhaps the points all clustered very close to 1. The pattern for brain cancer, for example, is what we might expect from a few relatively under-powered studies, some showing increased risk (relative risk greater than 1) and some showing reduced risk (values less than 1). Conversely, even if the confidence intervals in any single study aren’t strongly indicative of an association, if different, independent studies all result in point estimates greater than 1, then it suggests there might be something going on. And this is what has been observed for the association between glyphosate and non-Hodgkin lymphoma. This is important, because that is the type of cancer specifically called out in the IARC cancer classification, and the type of cancer involved in the recent court case. Many of the confidence intervals contain 1 (meaning no statistical association between glyphosate and non-Hodgkin lymphoma), but all of the point estimates are greater than 1. So although there is a lot of variability in the data, the association of glyphosate exposure and non-Hodgkin lymphoma does appear across multiple studies. Certainly, it is logical that if multiple studies find a similar association then it must be more likely that the association is real. But it is also possible that this association shows up multiple times simply because researchers are looking for this result. Researchers can’t ask people about every single aspect of their lives – they try to ask questions for these case control studies that are likely to provide information relevant to the cancer they’re dealing with. So if glyphosate (or another pesticide) appears like a potential cause in an earlier study, subsequent studies will include questions about that pesticide. Which makes sense! But, it also has the potential to bias the result in favor of a positive association if these same studies are not controlling for important confounding variables. Many of the case control studies I read evaluated 2 or even 3 different models comparing glyphosate-exposed and non-exposed people (and those are shown with multiple points and intervals on the line for that study). The difference between models was usually an attempt to adjust for confounding variables (like smoking or family history of cancer). Confounding variables are an important limitation of case control studies, especially when trying to pin down the effects of a single pesticide. For example, studies have associated non-Hodgkin lymphoma with farming activities since the early 1990’s – however, it has been difficult to figure out exactly which farming activities are most likely to blame for this association. Because lots of farmers do lots of the same things. Certainly, farmers tend to use a variety of pesticides, but there are a number of other confounding variables among this group. Farmers probably also inhale more dust and fertilizers. They are out in the sun a lot. Farmers also get exposed to more hydraulic fluid and diesel fumes and wake up earlier than the general population. All of these factors are extremely difficult to control for in a case control study. An additional limitation of the case control studies I read is that a very small fraction of non-Hodgkin lymphoma cases were actually exposed to glyphosate. For example, only 97 people (3.8% of the study population) had been exposed to glyphosate in the DeRoos (2003) study. Only 47 people (2.4% of the study population) had been exposed to glyphosate in the Eriksson (2008) study. These are very small numbers. To look at it another way, only about 3% of the non-Hodgkin lymphoma cases in most of the case control studies had actually been exposed to glyphosate, and therefore around 97% of non-Hodgkin lymphoma cases in these studies had nothing to do with glyphosate. So even if glyphosate does increase the risk for cancer, it seems to not be a major contributor to this type of cancer in the general population. But case control studies aren’t the only types of studies that have been used to investigate the link between glyphosate and cancer. A prospective cohort study is another type of observational study, and one that avoids some of the limitations of case control studies. In the case of a prospective cohort study, the questions about factors that might contribute to a disease are asked before any of the study participants get the disease. In case control studies, the question being asked is “What could have caused this disease?” In a prospective cohort study, the question is more like “What diseases could these risk factors cause?” Researchers attempt to clearly define a set of risk factors for participants in a prospective cohort study, and they are then monitored for a period of time (sometimes their entire lifetime) to observe what types of health issues they end up having. Cohort studies certainly have their own set of limitations, but one particular cohort study — the Agricultural Health Study (AHS)— was designed with pesticide use explicitly in mind. When it comes to teasing out the effect of specific pesticides, it is difficult to do better than the AHS. This study has well over 50,000 participants, many of whom are regular pesticide applicators. This group is almost certainly more likely to characterize their pesticide exposure accurately compared to participants in many of the case control studies. In all four groups, the point estimates were less than 1, and the confidence intervals contained 1. This suggests that exposure to glyphosate did not increase the likelihood that pesticide applicators would develop non-Hodgkin lymphoma. And it didn’t matter how much glyphosate the applicators were exposed to, the risk ratio estimates were very similar. One would expect that if there were a causal link between glyphosate and non-Hodgkin lymphoma, that as exposure to the herbicide increased, the likelihood of cancer would also increase. But this trend wasn’t observed. Among this group of 54,251 pesticide applicators, there was no relationship between glyphosate exposure and non-Hodgkin lymphoma. This result is similar to previous analyses of the AHS data, which also showed no association between glyphosate and non-Hodgkin lymphoma. And this study — even though it is only one study — makes it difficult for me to believe that any single case of non-Hodgkin lymphoma could be blamed on glyphosate. 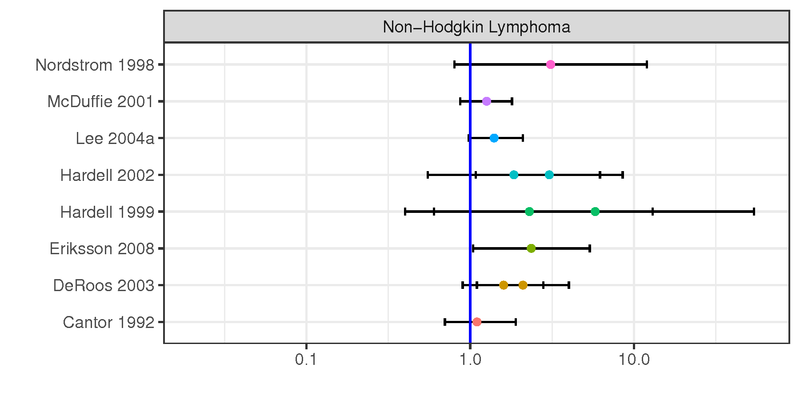 The largest data set we have (by far) which does the best job (by far) of accounting for confounding variables shows absolutely no association between handling glyphosate and developing non-Hodgkin lymphoma. A few years ago when I wrote about this topic, I noted that my mind could certainly change as new evidence came to light. At that time, the AHS study had relatively few cases of non-Hodgkin lymphoma – but in this most recent analysis, there were well over 500 cases to be analyzed. And again, there appeared to be no relationship to glyphosate. So again, I’m not sure what the jury saw in this most recent case. But based on the evidence I have seen, I remain thoroughly unconvinced that glyphosate causes cancer.